They say the couple that plays together stays together. People must be catching on to this secret, as totally adorable tandem bicycles have been popping up all over. 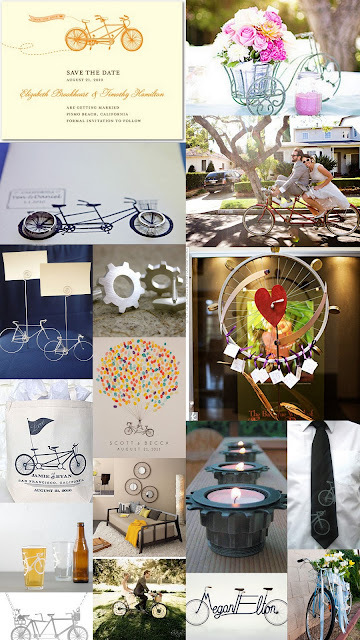 The image of the tandem bicycle is one that we associate with happy couples that work as a team, riding in unison, and who genuinely enjoy having fun together. If life is a journey or an adventure, we say grab hold of the handle bars and enjoy the ride...on your bicycle built for two. Cuuuuute! I like the fingerprint idea...but I think I have another idea that doesn't go with any theme at all for the wedding but I really like it anyway, hahaha.